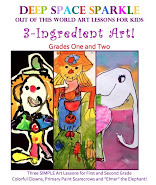 This lesson was inspired by a lesson in The Usborne Book of Art Projects. It was a huge hit with my third grade class. The lesson in the book focused on fish but I thought a sea turtle would look lovely swimming in these glittery waters. As for the glittery waters, I had some glitter concoction left over from my Fancy Fish Lesson, so I had the students brush the leftovers onto a piece of blue or lavender drawing paper. The results were shimmery and ocean perfect. If you don't have the supplies to make the glittery concoction (glitter paint, Mod Podge and liquid watercolor) try making the background using 6" x 9" pieces of watercolor paper. 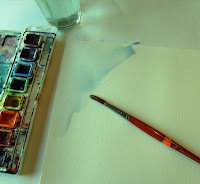 Wet the paper with a sponge or large brush, then mix blues and green watercolors and paint on the wet watercolor paper (wet-on-wet technique). 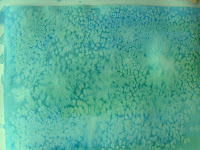 Salting the surface will give the "ocean" a sparkly quality. While the paper dried, I demonstrated how to draw simple fish and a sea turtle. See diagrams for a step-by-step. After demonstrating the drawing technique, hand out pieces of tin foil (regular is fine, but heavy duty works really well), colored Sharpies, and texture boards (instructions below). 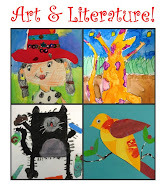 Put tin foil directly onto texture boards and draw fish or turtle. 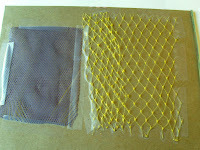 Color with Sharpies and watch the texture of the netting show through. The kids LOVE this step. I do, too. It's really cool! 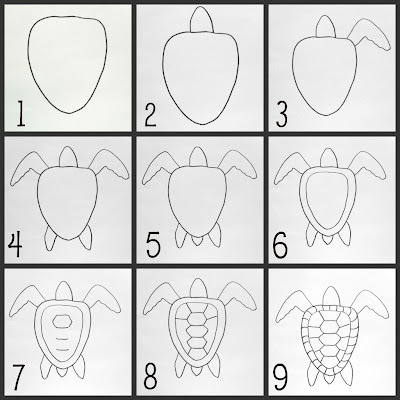 After drawing a large turtle or a few fish, carefully cut out fish and glue (white school glue) onto glittery or watercolor paper. To make a Texture Board, cut heavy board (tag board, etc) into 9" x 6" rectangles. Sizes can vary so don't stick to my suggestions. Cut up old vegetable or fruit bags and tape to cardboard. I made about 25 and had a few 6th graders help with the taping. What a cool technique - these are really beautiful! I would just like to say that I absolutely love this blog! So much inspiration! Thank you for the time you take sharing it with us. Katie: I know! The kids loved this lesson. My third grade classes have been challenging this year so I knew I needed something great to hold their attention. It worked. The kids were attentive and engaged. Just make sure to explain that the foil might tear when cutting but that gluing will fix the problem. Sonja:Thanks so much for saying this. It keeps me going! Hi. First of all this site is terrific so thank you! It may sound like a silly question but could you please tell me what you mean by coloured sharpies? In Australia we may use another term? Sharpies are a cheap brand of waterproof markers in the US. Thanks for pointing out the confusion! open up a Flicker account and have people post there...or email me photos? Any suggestions? Wow excited, thanks for freshing my ideas.